My information about the schools available to the children of miners is sketchy. More will be added on this topic when I get it. Some kind of school was erected by the Rosedale and Ferryhill Mining Company at Rosedale East in 1867. Part of its cost was met from funds collected by the miners. The first teacher was a Mr Richardson, but he had to combine his teaching duties with work as an engineer, architect, and surveyor at the mines. Children living in the railway cottages at Blakey Junction went to school in the neighbouring dale, Farndale. They went by train on Monday morning, taking with them enough food for five days, and lodged with people in Farndale until returning home on Friday afternoons. The mining company provided a lecture hall and reading rooms for adults. 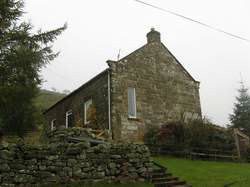 The lecture hall was built next to the parish church in Rosedale Abbey, and there were reading rooms in the hamlet of Thorgill and opposite School Row on the eastern Daleside Road. Part of the lecture hall was used as a hospital. From time to time it had to deal with injuries suffered in accidents, a topic to which we shall return in a moment. I do not know how many miners maintained regular attendance at places of worship. 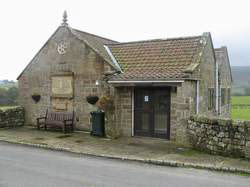 Apart from the parish church they had a choice of several non-conformist chapels, including a Wesleyan Methodist chapel in Thorgill, a Primitive Methodist chapel in Rosedale Abbey, and another Methodist chapel opened near the East Mines in 1872. The most popular public house seems to have been the White Horse, a short walk from Hollins Mine and the Barracks. You can still have lunch there today. 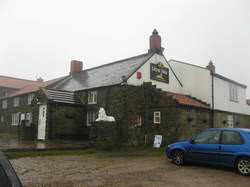 Railway staff based at Blakey Junction would have visited the Lion Inn, now a lone landmark on the moor often used by Coast to Coast walkers to refresh themselves at midday. Next to the lecture hall in Rosedale Abbey was one of the two main shops. The other was on the eastern Daleside Road. These shops, providing services that elsewhere might be offered by a newsagent, tailor, baker, and shoemaker, were much resented as they were regarded as enjoying a monopoly charging high prices. It was alleged that they were let by the mining company at high rent on condition that no other similar shops would be permitted. Anyone attempting to establish a similar business would be given notice to quit. In 1873 and early 1874 several meetings were held by miners and their wives with the aim of setting up a co-operative store, but it seems the aim was not achieved. From time to time bad weather would disrupt the railway and make life difficult for people living in the railway cottages at Bank Top and Blakey Junction. The winter of 1894/95 was especially severe. There was a blizzard on 31 December 1894, and within two days all roads in Rosedale were blocked by snow. A group of miners living at Lastingham, a village to the south of Rosedale, struggled to get to work at Sheriff’s Pit through the snow but were forced to give up after three miles. One of them, Willie Gibb, became separated from the group and was lost. Six hours later he was found exhausted on Bank Top. A second blizzard came on 13 January. 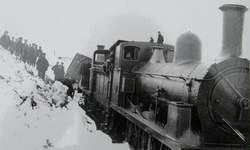 A hundred men or more were employed in clearing the railway line, but they failed and eventually the line was entirely submerged under 20 foot drifts. Very low temperatures arrived in February. 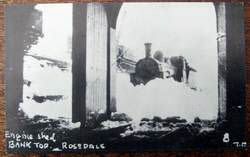 Postal deliveries were severely obstructed, and it became very difficult to bring supplies of food, coal, and other essential goods into Rosedale. 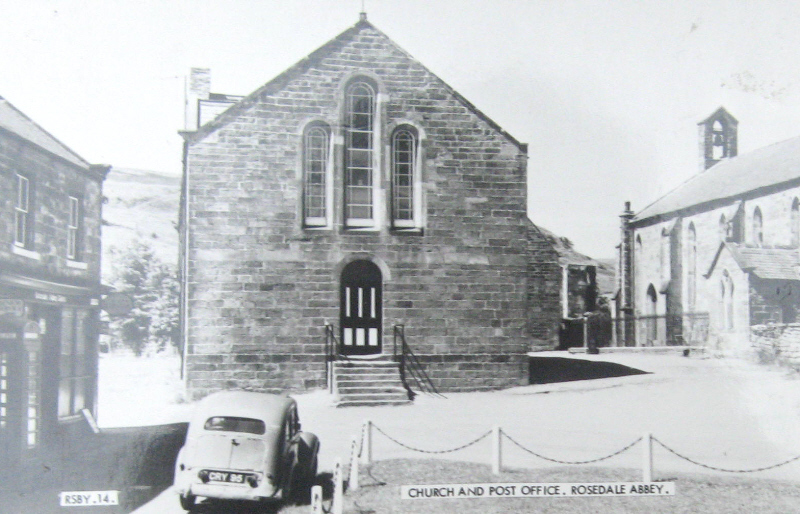 Soup kitchens were opened in Rosedale Abbey for those families who had run out of food. The snow did not begin to thaw until 19 March, but even then the railway line could not be re-opened until the middle of April. This information about the winter of 1894/95 comes from R H Hayes, A History of Rosedale, North York Moors National Park, 1985. The centre of Rosedale Abbey. 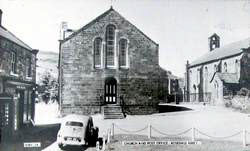 The shop and post office can be seen on the left, the parish church on the right, and the lecture hall between them.